October was a relatively successful month in terms of feature commitment->delivery. However it was also a relatively small commitment, and I did not deliver the chat commands (though technically those weren’t promised on a timeline…). The new Post Processing stack is available with the Halloween Update, and it looks pretty nice. The Halloween Hedge Maze was delivered as promised and I really think it came out nicely. It also gave some nice improvements to the normal Hedge Maze. The Dedicated Servers actually run very stably now. I basically don’t have to pay attention to it anymore, except that the system it’s running on has really low RAM so sometimes it gets full, or Window Update installs & restarts without consent. I’ve noticed many comments about how I need to host more servers. 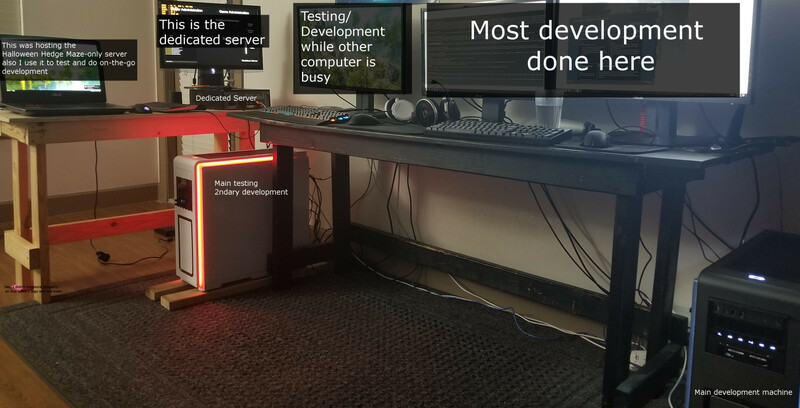 The problem with this is, I don’t have any additional computers to host on :). I need 3 machines to fully test Client-Server-Client interactions, and as you see, I only have 4 :). This is precisely why I enabled the ability for anyone to host their own server (and wrote a guide detailing exactly what you needed to do to accomplish this), and since then, worked to solidify the Dedicated Server. In case you haven’t followed the development of Hide and Seek, this is a one man show. I don’t have a team of people producing this game. It’s just me. Again, everything here is what I plan to be immediately working on. Depending on how long each one takes they may or may not all get done in November. As said in October’s Devblog, some chat commands are becoming available. I’ve actually completed this, and the update will be available with some other upgrades pretty soon. Additionally, an optional language filter will soon be added (this will be turned ON by default, you can turn it off in the game settings). Some performance improvements related to the Chat System are also going to be batched in with these updates. This is kind of a 2 part item. The first one, I hope this one is transparent to everyone. The way I have the UI done right now is not very good, so I want to make it easier and more consistent across levels with less copy/pasting work which results in some of the inconsistencies you see. The second one is to make the UI less static and be more interesting in general. Right now it looks maybe “okay” but I’d like it to look clean, polished, and “good”. This was brought up in the Community Hub as a problem (and vote kick was the proposed solution). I will be adding it in the next patch. After 2 minutes of inactivity you will be disconnected from the server. This really a necessary thing in Hide and Seek since an AFK seeker is really annoying and there’s nothing really you can do about in the current state of the game. The vote kick option is something I am toying with as well. It does have the potential for abuse and that’s why I’m doing the AFK kicking first. I’m not sure at this point if I want to add a potentially abuse-able functionality. Right now the only way I receive feedback is through reviews (which in most cases tend to be either extremely rude, and/or vague and unhelpful – neither of these types help improve the game), and the few people that come to the Community Hub to talk on the forums. I want to enable in-game 1-click feedback (+ typing your feedback of course) so any user can leave a bug report, feedback about a level, or whatever they feel they want to convey. I’m hoping the in-game access will give me a broader, and more detailed set of feedback. I am continually optimizing Hide and Seek. I mentioned in the 1.0.1.68 patch notes some performance optimizations were made. More are on the way! This is probably what I’m most excited about bringing out. Unfortunately, I didn’t get any time at all to work on this last month due to the Halloween Hedge Maze taking more time than expected, mostly due to it having more gameplay & new visual elements than originally anticipated. That’s not really a bad thing; I’m really happy with how the Halloween Hedge Maze came out. Since the rest of these things I’m saying I’ll be working on are mostly UI, I’m really excited to spend a lot of time getting the Space Station level developed further. I do not anticipate it being done this month, or even in December. But it is now on the “primary work” track instead of the “when I have unexpected extra time or don’t feel like doing something more important” track. Yes I am still going to add Skills. I have a pretty good idea now what I want the Hiders and Seekers to be able to do, it’s just a matter of fully implementing these things. I did some work on these in October, mainly when baking lighting and/or occlusion since that makes this other computer totally useless for a while. Some modeling, animation, and even player-skill interaction. I think it’s coming along nicely. This is probably what I’m second most excited about so it’s a battle for my time between this and the Space Station level. When I have some complete end-to-end solutions I will create a video with all of the skills as a kind of teaser. I also would not expect these this month or even December. It’s not going to be done for a while so technically it’s longer term.